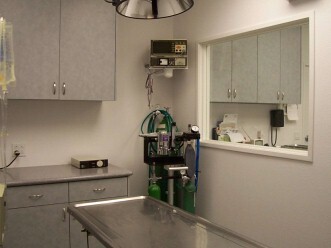 The Treatment Room is the 'heart' of the clinic: Surgical Preparation, Dental Procedures, Radiography, In House Laboratory, Electrocardiography, Wound Care and Bandaging. 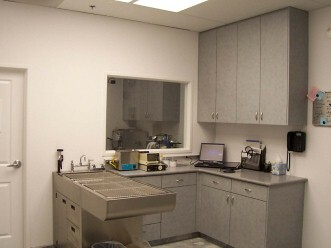 With our on-site laboratory equipment, we can perform General Health Screens and Pre-Anesthetic assessment of Blood, Urine and Stool. 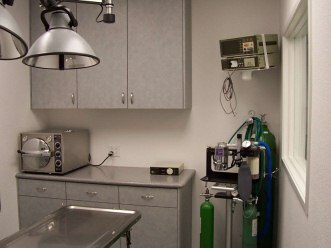 We have on-site radiographic capability ["X-ray"] including Digital Dental Xray. 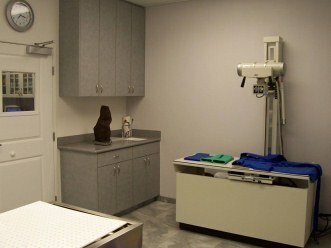 Our Surgical Suite, shown below, is designed to accomodate both Minor and Major surgeries - Soft Tissue surgery [such as 'Spays' and Neuters] and Orthopedic procedures [fracture repair]. Anesthetized patients are monitored closely and continuously via Pulse Oximetry, Blood Pressure monitoring and Electrocardiography.